I am home now from my trip to Costa Rica, filled with fun memories of both beautiful places and warm people. My son and I had a great time together learning Spanish, rappelling down waterfalls, river rafting the Rio Pacuare and even trying to learn to kayak. When I got back to church on Sunday, everybody kept asking me if I had "learned" Spanish. The answer is a clear, firm "yes". And "no". After five weeks "in country" and in intensive classes, I now "know" quite a bit of Spanish. I have learned conjugations for three past tenses, present tense and a future tense. I even know the differences between the two different forms of "to be" and "for". But, using it...well, it's still pretty rough. Even though I know what to say, I can't always say it, at least not correctly. I just need more and more practice. And then there is the matter of actually understanding people. Again, more practice. Somebody who is pretty well versed in languages asked me, "Are you dreaming in Spanish, yet?" I said, "Oh I am dreaming ABOUT Spanish (like I used to dream about Trigonometry in High School and Greek in Seminary), but I am not dreaming IN Spanish, yet." She replied, "Well, once you are dreaming in Spanish, then you will know you are on your way." There is a long way from "knowing" to "being". The road is through "practice." Jesus said a very similar thing about his teachings, "If you know these things, you are blessed if you do them." (John 13:17). It is very possible to know either a language or "the truth that will set you free" and still not be very "blessed" (or much of a blessing). At least until you moving from "knowing" to "being", via "doing." Another lesson on learning anything while I am working on learning this one thing (Spanish). When I first started learning Spanish it was hard. I felt dumb. I was embarrassed and it seemed hopeless. I wondered how I ever learned to speak English. I hate being a beginner at anything. I always feel like I did when I was a new Freshman walking around my high school campus trying not to get lost, convinced that all the older kids were laughing at me. It was just hard. Not TECHNICALLY hard, but emotionally so. And the pain of the necessary humility needed to begin something new kept me from doing anything new for a long, long time. I told myself that I wouldn´t do anything if I couldn´t do it well. Or that you really can´t teach an old dog..blah, blah, blah. But it was just really hard to feel so incompetent at something so basic. And then it got easy. Almost a rush of enthusiasm, confidence and excitement filled me when I had my first (oh, so, basic) conversation with a cab driver. I actually said to him, (and I will never forget it), Ï want to go to a restaraunt, but I need to go to the bank.¨ I was hooked, I was talking. I knew that I sounded like a baby, but I didn´t care. This all seemed so easy. I was learning words, and verbs and grammatical structures. (All present tense, mostly infinitives and often pronounced really awkwardly). Other tourist types told me that I was pretty good at this Spanish thing. The people I met encouraged me on, telling me that they couldn´t believe that I had only been doing this for a couple of weeks. It was easy. I went to Mexico earlier this year and was totally impressed with myself. I even told others that I thought I was doing well and really making strides. I actually thought that I could begin to hold a conversation with someone. It was easy. And then it got really hard. 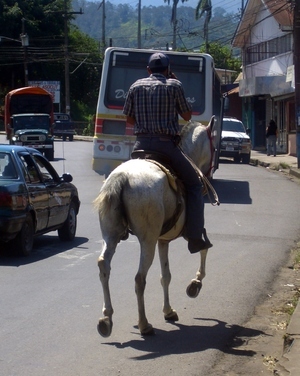 I arrived in Turrialba and realized that I couldn´t understand one word of ¨normal¨ Spanish. Oh, if a teacher talked VERY CLEARLY AND VERY SLOOOWLY I could make out most basic sentences, but I still haven´t understood a single word spoken on the streets or at the supermarket. I realized that if this was ¨real Spanish¨ I was still really, really bad at it. And so then it got really, really hard. I had a decision to make. Was I really going to learn this language, or just have a few basic tourist phrases? Did I really want to have a conversation or was I just interested in spouting off a few things. And most of all, did I really want to go through the hard, and equally humbling experience of learning to listen to people. Aye, yi, yi. This was hard. Was I just going to become ¨familiar¨with Spanish, or was I really going to use it in the real world? And now, it´s still hard. And sometime´s it´s easy. And sometimes it makes no sense at all. Today I learned a type of past tense that doesn´t even exist in my original language. It´s not translatable, it just is. I have to learn to think differently. And that is what a lot of learning this language is. Learning to think in a new way, in a different world, to a whole new universe of people. It is hard, it is easy. It just is. I have a hunch that Christianity is like this too. Over at Rob Asghar´s blog, some of us are taking up a conversation on the resurrection. And in someways, a whole conversation about Christianity with a group of folks who have been doing this a long time is in the ¨really hard¨ stage. It will be interesting to see what getting to the ¨just is¨ stage looks like. I am at the end of what is my fourth week of intensive Spanish lessons in Costa Rica. After three weeks last year and one of two weeks completed this year, I am beginning to learn both a little Spanish and some other lessons about learning itself. Since ¨discipleship¨ is really about becoming a learner, or apprentice of Christ, I have a hunch that some of the best lessons I may learn along the way, may have little to do with Spanish at all. So, consider these rough drafts of the beginnings of ideas that I need to think about a bit more. First, most of learning revolves around listening. And listening and understanding is much, much harder than speaking. After four weeks of doing this, I have ¨mastered¨ the basic phrases. I am ready to punch them out on demand, when I want to say something. ¨I want to eat.¨ Ï need to go to the bank.¨ ¨I like...whatever.¨ I, I, I, I. But when the conversation is not one that I began. Or if it goes longer than a simple exchange, I am quickly lost. Even worse, half the time, I am not even responding to what the person in front of me actually said, but what I ASSUMED they said. Twice now, I have responded to someone´s kindly greeting with a hearty ¨Gracias!¨ Now there is nothing wrong with being grateful, even for someone saying hi to me. But in both cases, I was simply on auto pilot. I actually know how to greet someone and carry on the most basic of conversations. Unfortunately, most of the time, I didn´t even hear what they said to me in the first place. I was so busy with my assuptions that I missed the chance for a conversation. The more I learn Spanish, the more I realize how really hard it is to listen, well. When I spend so much of my time trying to figure out what to say, or how to say something correctly or clearly, I completely miss the point of all this work. And I am beginning to wonder if I don´t do this all the time. Even in the language that I most comfortable speaking. Maybe especially so. Brooks and I have returned to Costa Rica for two weeks of language school, this time in a town called Turrialba. Turrialba is in the center of the country and for Costa Rica it is far from the tourist areas that most Americans frequent. What that means is that it is much better for Spanish immersion because people actually and mostly speak only Spanish here. In Dominical and La Fortuna there were so many english speakers that it was actually a little hard to practice Spanish last year. Much easier for a beginner and a tourist to feel at home, but perhaps a bit less authentic. Turrialba is the real deal. For my son, it even took a few hours of adjustment. After staying in smaller more tourist friendly areas in the past, this has been a stretching adventure. But within 24hrs we had come to feel quite comfortable here. We are staying in a little two bedroom apartment that opens to a street that is a pure urban neighborhood. Bars on all the windows, stray dogs wander the street and yet it is safe and quiet. Families are everywhere and nobody pays us any mind. In the back of the apartment, runs the tiny Rio Colorado and we have a delightful back porch that overlooks it while sitting under a huge orange tree. We walk to school every day about 20 minutes and we eat at a ¨Soda¨ every day for lunch. Everything is normal prices, not tourist prices. I have yet to pay more than $10 for a meal for Brooks and me combined. The internet costs about 50 cents an hour. Dominical was ten times that. The people are friendly and if you speak kindly to them, they will speak kindly and slowly to you. Once again the language instruction is wonderful and this time the great suprise is that I have met Christians. I have found that there are not as many Christians around tourist towns, but once you get into a Regular Town, you find folk with faith. It has been a wonderul experience so far. We have even packed in a bunch of fun. Kayaking, Canyoning, already. A volcano hike and then a river rafting excursion this weekend. We have one more week ahead of us and every day I thank God for the chance to have more adventures with my son, to expose him to the world and learn more about the joy of continuing to stretch and learn. It is one of the lessons I love to relearn over and again when I travel.